Begin by measuring your fabric to the appropriate size. You must first figure out the stitch count of your design horizontally and vertically. Most patterns will supply this information in the directions. For example, if your stitch count on your pattern is 140 (vertical) X 112 (horizontal) you would divide each of these number by the count of the fabric you have chosen. Let’s assume you have chosen a 14 count Aida cloth (which means there are 14 stitches or squares per inch). You would divide each stitch count by 14. Don’t forget to add another 4 to 6 inches to each measurement for framing. Cuts of fabric. There are a few different cuts of fabric. We follow the same guide lines for cutting fabric as quilters do. These are all cuts of a full yard of fabric. The smallest size being a fat quarter, the next size up is a fat half and then the full yard. , If you were to take a yard of fabric and lay it out flat and cut it into 4 equal parts vertically and horizontally, one of the four pieces would be considered a fat quarter. A fat half is that same fabric cut horizontally right down the middle to make two halves. Of course, a full yard is the whole piece of fabric. Most patterns will fit onto a fat quarter of fabric. Some patterns, like Lavender and Lace Angels require a little more fabric. A fat half is more appropriate to allow ample room for a matt and framing. Be sure to double check your math before cutting. Once you’ve cut it, it’s too late. There is no taping it back together. It is also smart to make sure you have the correct fabric and the correct count of fabric. 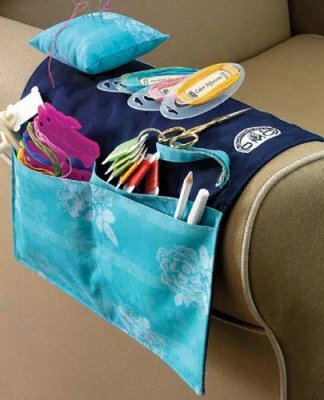 A cross stitch gauge is a great way to check what count your fabric is. Measure one inch of fabric and count the number of stitches you can stitch in that area. That will tell you what count fabric you are working with. If you count 14 stitches in an inch, than the fabric you are working on is a 14 count fabric. Next, use masking tape to tape the edges of your material to prevent fraying. You can also serge the edges of your fabric with a sewing machine. There are also products on the market that can be applied to the edges of your fabric to stop fraying like Fray Stop. Follow the directions on the bottle. Then, organize all of your floss colors in one floss container in numerical order for easy access. Keep any other material you will need to complete your project in the container as well, like beads and specialty threads, extra needles, etc. Be sure to check how many skeins of each color you will need so you don’t run out. This information should be provided in the directions or in the color chart. I like to keep my floss on reusableplastic bobbins with a number tag. Some people like to use small bags to hold their floss called Floss Away. Several manufacturer suggest washing your fabric and floss before stitching to avoid having any of the colors run. I am not overly fond of this idea. There is a product that can be used for this process should you choose to do so. It is called Fabri-Care. Read and follow the directions on the bottle carefully.